50-foot diameter, perfect circular shape. Circumference dotted with large granite boulders. Surrounding our circle is a range of the bluest waters imaginable. Deep royals, rich navys, distant cornflowers, and endless azures. Our circle rises with only slight symmetrical convexity from which sprout dozens of fragrant evergreen trees. A padded pine leaf surface provides our base, downed wood provides our warmth. For this weekend this is our island, this is our Minnesota world. Voyageurs National Park is an endless wilderness of water. Its lakes feel more like oceans than ponds. The water runs deep and the sky is endless. There’s no hiking here. Land exists as a border, a barrier. We explore via two-person canoe, like the fur-trapping french canadian voyageurs before us. Our bags sit in between us two paddlers. We travel wherever the water takes us. Our only fixed destination is one of the Park’s many campsite that dot the border landscapes. Our first day’s journey will zig zag from campground to campground looking for an empty nest. We arrive at each campground too late. Our binoculars show no openings. Each haven is occupied by a motorboat working with far more horsepower than our tired triceps. Each site brings another failure. It’s starting to get late. We’re still in our canoe. Our tensions rise and the arguments ensue. Then she appears: our island. She looks flat, she looks empty, she looks secluded, she looks safe. She’s not official but she looks all right to us. Others have been here before. Perhaps last week perhaps last month. A brass marker proves she’s been surveyed by the U.S. Geological Service. But she is ours now. We relax and the worry dissipates. We’ve been canoeing all day but this is the first time we’ve taken in our surroundings: it’s beautiful. We sunbathe on our rocky shore and watch the sun set for what seems like hours. Bald eagles fly overhead. We spot a moose swimming from island to island. The next day, we sleep in until the rain stops. We only leave to explore the neighboring islands looking for firewood. That fire never happens. Black skies come rushing toward us almost as quickly as the motorboats scurry to get back to their campsites. A downpour is coming. We collect our things and jump in the tent the second before the heavens open. Our tent is being whipped by sudden bursts of wind; our weight is the only thing holding it down. We sneak a peak outside a see ferocious whitecaps and a threatening darkness. Twenty minutes later the skies clear, the waters calm and a phenomenal sunset captures the world. “Could we stay on our deserted island forever?” we wonder. Maybe if we had remembered our fishing rods. A boreal forest ecosystem carved by Ice Age glacial action consisting of dozens of lakes and hundreds if not thousands of islands. Voyageurs NP is a water-based park. 84,000 acres of water, in fact. Hiking trails exist, but their entry points must be reached by boat. The waters glisten, the islands charm and the skies shine a stunning blue. Numerous bald eagles soar above while one of the continent’s largest varieties of warblers sing in the background. You comment to yourself, “this place is so beautiful”. Then another motor boat loudly speeds by and rocks your canoe. More so in the Park’s name. These lakes were just a traveling route for the Voyageurs, like a present-day interstate. Park videos will explain the Voyageurs to some extent, but if you are interested in the history of the French-Canadian über-trappers, go to the site of their annual rendezvous: Grand Portage NM, Minnesota. The National Park Service sites are for everyone, snowmobilers, motorists and boatsmen alike. Still, the ubiquitous presence of outboard-motored fishing boats brought our humble canoeing selves to a breaking point many a time. We wanted to experience the pathways of the voyageur, voyageur-style: in a canoe. Wrong choice on a weekend. We fought constant wakes from inconsiderate anglers. Finding a campsite was impossible given our distinct speed disadvantage, the crowded nature of the Park and the relative lack of park designated tent sites. After entering the Park’s waterways, we slowly paddled from filled campsite to the next while our high-speed, first-come, first-served competition easily claimed the empty sites; preparing their ornate tents while we cursed our canoe, each other and motor boats in general. We eventually found a darling island, about 60 feet in diameter (not an actual campsite) where we were able to pitch the tent. Little did we know that we were in earshot of two official sites where the swearing, cribbage games (presumably), and outboard motors blocked out all natural sounds until long after 11:00 p.m. Lest we sound too grumpy, we did have a great time. Just don’t expect peace and tranquility. Ranger-led boat tours start in mid-June for a fee. Until then you need to a rent or purchase a water going craft to experience anything. We visited three of the Park’s four Visitor Centers. All three had terrific book selections ranging from Ojibwa legend and fiction, Voyageur books, and a large selection of birding information. We were tempted to buy an adorable stuffed moose but somehow relented. There are plenty of other kid-related items, nice T-shirts and a waterproof map of Voyageurs NP for $8.95; cheaper than the $10 version our canoe outfitter was offering. The park itself is free, as is the backcountry camping pass. The boat you need to travel within Voyageurs is not. Plan accordingly. There are only a few outfitters nearby the Park. Most of the lodges offer boat rental but only if your staying with them. All Visitor Centers were staffed with numerous friendly and helpful Rangers. We suppose there are Rangers out on the water, patrolling the lakes but it’s hard to differentiate between all the boats speeding around you. There are three Visitor Centers at strategic shoreline points – each had unique exhibits and displays, as well as their own bookstores. At the Ash River Visitor Center, we had our choice of movies – one on the voyageurs, one on the formation of the waterways and one showcasing the park and its flora and fauna. We watched one on the park itself while we waited for our outfitter to come pick up the rented canoe. The Rainy Lake Visitor Center was host to a Birders’ Rendezvous the weekend we were there. Kabetogama Lake Visitor Center was where we found out about the closest canoe outfitter and gaped in amazement at the photos of two bald eagles fighting in the Lake. The photos were taken by a Ranger getting ready to lead a boat tour. Ranger-led boat tours do not begin until the middle of June so we had no opportunity to partake. There are additional fees for most tours. The first three to four hours of the first day were no fun at all. Once we got the hang of paddling the canoe together, overcame our fear of being tipped by the wake of a speeding motorboat and finally found a flat, semi-private place to camp, we had a blast. We should have known better than to set off on one of the first hot weekends in June. The stress of finding a place to sleep was overwhelming – once we spotted our island, the worry dissipated and we were able to sit back, relax and really look at our surroundings for the first time. This place is beautiful. We sunbathed on our rocky shore. We watched the sun set for what seemed like hours. The next day, we slept in until the rain stopped, then paddled around the neighboring islands exploring and looking for wood for the evening fire. That evening fire never happened – black skies came rushing toward us almost as quickly as the motorboats scurrying to get back to their campsites before the downpour. We had just enough time to collect our things and jump in the tent, which was being whipped by sudden bursts of wind. We held down the tent as water poured down and whitecaps formed on the lakes. Twenty minutes later, the skies cleared, the waters calmed and we had yet another phenomenal sunset. When we recounted our experience to the canoe outfitter he thought for a minute then said, “that actually sounds like a lot of fun.” It was. The Lakes are beautiful, just not peaceful. The Park seems to be unique in that it caters primarily to sportsmen. Perhaps it would be better designated as a National Recreation Area. We cannot attest to the fishing quality but there were anglers everywhere. They all seemed to be having a great time in a stunning natural setting. Who knows how many walleye, northern pike and smallmouth bass they were catching. We would not recommend Voyageurs for a canoeing vacation. Go to the nearby motor-less Boundary Canoe Waters which are part of the National Forest System (under the Department of Agriculture jurisdiction and sadly, not a destination on our two-year sojourn). The largest Island in the world’s largest freshwater lake. Isle Royale NP is a World Heritage Biosphere. Isle Royale is an incredible 99% wilderness. The 1% includes only the Rangers’ living quarters, a small lodge, two Visitor Centers and the campgrounds. The 45-mile long by 9-mile wide island boasts hundreds of moose and three wolf packs. Spring came while we were on the Island. Wildflowers bloomed in front of our eyes; trees became a luminescent, full lime green. We thought that we had seen a newborn moose calf, but closer inspection revealed a yearling. 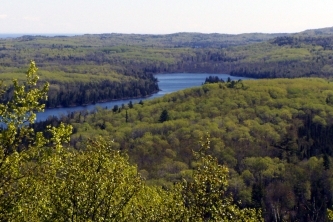 Much of the hiking goes along the ridge and through the dense boreal forest. When the forest opens, you remember that you are in the middle of Lake Superior. Clear skies enabled us to make out the skyline of Thunder Bay, Canada, 35 miles away to the north. Nothing spoils the serene beauty here on Isle Royale. No cars, no buildings and no unnatural sounds. Isle Royale has mildly interesting stories of unsuccessful mining operations and dramatic shipwrecks. We found the Island to be compelling because of its veritable lack of human history. Few people have ever lived here and the forests are still virgin. Moose first migrated here in the 1900’s by swimming! A few wolves crossed the extremely rare frozen Lake Superior to get here in the 40’s. That’s cool stuff. We found solitude at Isle Royale NP. There were very few people even on the most popular hikes. The people that we did see shared with us the same sense of personal accomplishment, detachment and amazement. There was a strong kindred spirit among all visitors to the Island. Perhaps the most remote National Park in the continental United States. You need to take a sturdy sea-worthy boat or a seaplane to get here. Once you are at Isle Royale you must use either its moderately difficult trails or travel by kayak or canoe through its harbors and lakes. Only one rustic hotel exists and even if you are staying there, you need to get out into the backcountry to see anything. You must hike (or paddle) and stay in a tent. There is no other way. This Site appeals to a very small and specific crowd, the willing outdoorsman. That being said, most visitors come to Isle Royale NP for the isolation and the solitude. They would say the Park’s lack of access is its strongest asset. After a day of seeing zero people and six moose, we agree. But our rating system is not perfect and for continuity’s sake the score must be a 1. Both the bookstore and the lone open food store on the Island had ample selections of merchandise but very little that we wanted. The weather effectively holed us in our shelter. There were no cheap paperbacks and no selection of games/puzzles. We wanted a memento from our trip but the T-Shirts, stickers and patches all suffered from a design deficiency. We wanted a pre-packaged meal but had to settle on the salt-drenched Zatarain’s red beans and rice. So yes there is a large selection of stuff, but nothing in that group appealed to us. The requisite boat to the Island is not cheap at $100 or more round trip. Staying on Isle Royale costs an additional $4 per day per person. Proper gear and preparation for the whims of Lake Superior will cost even more. Because of the steep transportation fee, most visitors spend at least 5 days on the Island. In fact, among National Parks Isle Royale enjoys the longest average stay per guest. Plenty of Rangers at the Isle Royale’s two Visitor Centers. No Rangers anywhere else. Immediately after stepping off the boat, a lovely Park Ranger gave us an instructive and necessary 20-minute orientation that focused on the Leave No Trace philosophy. Everything you bring on must leave with you. She also answered all of our questions about the Isle Royale. Everyone listened intently to her “What do we do when we see a moose?” answer. After the orientation, the Ranger issued the backcountry permits inside the Windigo Visitor Center. All hikers had to specify which campground they were to stay at on each night of their visit. We were not yet sure of our plans so the Ranger cheerfully indicated which campgrounds were the best and which vistas we should not miss. Our 10-minute talk with her was more helpful than the 175-page Isle Royale Hiking Trails book. After leaving the Visitor Center, we felt confident in our journey. We were no longer petrified about what we were about to do. Thank you, Ranger. Anticipation for this particular park has been mounting for nearly a year even though we weren’t really sure what to expect. We spent over two days in Duluth and a day in Grand Marais, Minnesota preparing ourselves mentally and physically for the challenge of our first real hiking adventure of the two-year trip. This anticipation and build-up added to our fun and sense of accomplishment. Seven days and seven nights is the longest we have ever been backcountry camping. In many ways, this was a test. Can our sedentary bodies still balance a pack? Will the novelty of pitching the tent wear out within a week? Will we get bored? Sick of each other? Answers: Yes. No. Only on a very rainy and cold day 6 and… hmm… well … No. In that order. We felt a range of emotions on the island. Excitement, fatigue, awe, hunger (after Gab dropped the tortellini dinner), pride. It was quite an emotional roller coaster, but we laughed and smiled and dropped our mouths in wonder a lot. We nearly shed tears of joy when the sun came out on day seven and Captain Ryan arrived with the Voyageur II. Later that day we were both misty eyed as the boat sped away and we lost sight of Isle Royale. We had a great time and were not the least bit disappointed. The beauty of the National Park was well worth the planning, the time dedication and the expense. Still, Isle Royale NP is not for everybody and Lake Superior can be a monster. You need to camp. Transportation must be done via hiking or paddling. Transportation to the Island is available only mid-April through October. Each season provides its own obstacle. If you are not fighting inclement weather, you will be fighting biting flies and mosquitoes. Our trip to Isle Royale NP was well worth it.